Four black parole officers on official business were held at gunpoint and detained by police last year, videos recently obtained by The Journal News show. Black law enforcement leaders are criticizing Ramapo police for the incident last April, saying it highlights a larger problem with how police treat members of the black community. "If these guys aren't safe, imagine what a young black man feels about interacting with the police," said Damon Jones, the New York representative of Blacks in Law Enforcement of America. "They have no chance." The state parole officers have a federal lawsuit pending against the town, its police department and others, alleging racial profiling and civil rights violations. Jones said Ramapo police need to explain "why they held the parole officers after they were identified." Town officials maintain police did nothing wrong. On a cloudy morning last April, just as the commuter rush was beginning to die down, at least five police officers surrounded the parole officers' car at a busy intersection in Airmont near restaurants and often crowded shopping plazas. Dash cam videos obtained by The Journal News under the Freedom of Information Law show police cars, with flashing lights, boxing in a vehicle later determined to be state-owned. One police officer can be seen immediately drawing a gun and aiming at the vehicle, using his police SUV as cover. Another officer can be seen reaching into the driver's side of the state vehicle as parole officer Mario Alexandre emerges, raising his hands in the air. After the parole officers were ordered out of the vehicle and were talking to police a third police officer carrying a rifle is shown approaching the group. Police later said they were responding to a report of people wearing bulletproof vests in a car and that the parole officers did not make a courtesy call to alert the department that they were in town for an arrest. The parole officers' car was not marked. Jones, who viewed the videos at the newspaper's office, questions why the parole officers were held at least six minutes after being identified over the police radio as state employees. "Would they receive the same treatment if these parole officers were white?" he asked. The parole officers claim in their lawsuit that they were traumatized, humiliated and feared for their lives. In the lawsuit, which also names Rockland County, the village of Suffern and Suffern Police Department as defendants, the parole officers claim they wore department-issued bulletproof vests and had gold badges and identifications clearly displayed on chains around their necks. They also had an official sign on the dashboard, "State of New York — Executive Department — Division of Parole," the suit claims. It alleges police ran the plate of the vehicle and had also confirmed parole officers had been at a home in Suffern, attempting to execute an arrest warrant. Alexandre and the other parole officers, Sheila Penister, Annette Thomas-Prince and Samuel Washington, are out on worker's compensation, said state Department of Corrections and Community Supervision spokeswoman Linda Foglia. She said she could not elaborate. The newspaper only obtained the videos after appealing a denial of a Freedom of Information Law request with the town of Ramapo. None of the four video clips contain audio from officers' microphones, so it's not possible to hear what appears to be a heated exchange between the parole officers and police. The lawsuit claims the defendants "failed to provide complete and accurate copies of audio/video recordings" to the plaintiffs as "part of their cover up to avoid liability." It's not more specific. The town wouldn't release the police reports to the newspaper, denying a FOIL appeal, saying there is an ongoing investigation. Ramapo police declined to answer any questions, including about the audio, referring all questions to the town attorney's office. "The actions of the town of Ramapo police were reasonable under the circumstances," said Ramapo Assistant Town Attorney Dennis Lynch, who declined to say what investigation might be underway. Patrick Withers, deputy town supervisor and a former NYPD officer, who viewed at least one dash cam video, said police acted appropriately. "I have no doubt when the court views all the documents and the evidence that our officers will be vindicated," he said. Grant Valentine of Chestnut Ridge, a retired parole officer and NAACP member, said, "I think it was an absolute case of racial profiling." He said there is no policy requiring parole officers notify police they are in town. "I think what they saw was four black people they perceived to have guns in a car and they reacted based on those assumptions," he said. The parole officers, he said, continued to be interrogated after being identified. "They are traumatized," he said. "They feel violated. 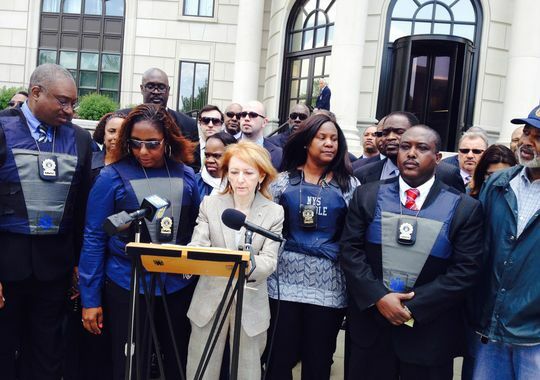 They feel betrayed by one of their fellow police agencies." The lawsuit, originally filed in October and amended last month, seeks an unspecified amount of money. It also asks for the court to require training of the police agencies involved "to prevent such conduct in the future." Ken Cooper, a use-of-force expert and president of Tactical Handgun Training of New York Inc. in Kingston, who did not view the videos, said police had to go "full-court press" based on the report they received. Although law enforcement agencies aren't required to notify other agencies when they are in town, he said it's a good idea to make a courtesy call. "Is it proper and appropriate?" he asked. "Should it be done by all agencies? Absolutely, to avoid injury to any officers." The uniformed officers, he said, were in charge, so it was proper for the parole officers to comply with their commands. As soon as police realized they made a mistake, they should have apologized and let the parole officers go, he said. Cooper said the situation could have ended tragically for officers and citizens. "It could have been horrific had the egos gotten out of control," he said.